Joan Diamond has been an active volunteer in Cedar Falls for over fifty years, generously sharing her time, talents, and resources to make a difference in the community and its artistic, historical, and philanthropic organizations. Joan Englund was born 3 February 1929 at Galesburg, Illinois, the daughter of William D. and Bertha Englund. She had a twin sister Wilma Jean (Mrs. Rowland Grimm), who died March 1963, leaving four children, Gerald, Laura, Jane, and Karen. Joan and Wilma graduated from Galesburg (Illinois) High School after which Joan earned her undergraduate degree from Knox College. Following graduation, she moved to Rockton, Illinois where for the next seven years, she was the Senior High School teacher of Spanish, English, and its Librarian. She attended the University of Illinois from 1953-57, from which institution she received a M.S. in Library Science. Joan moved to Cedar Falls in 1957 as an assistant professor and elementary school librarian at Malcolm Price Laboratory School. As its only professional Librarian, she was responsible for elementary through high school grades. Eventually, when a second professional was hired, Joan opted to focus on elementary for the remainder of her career, retiring after 33 years in 1990. Joan and Saul Diamond were married on August 14, 1965, at the home of Mr. and Mrs. Koert Voorhees in Cedar Falls. Joan notes that early in their relationship, Saul passionately expressed that they were to have an understanding that “you have to be active in the community, always giving back.” The Diamonds lived this philosophy throughout their long marriage of nearly 50 years before Saul’s recent death. Joan’s organizational skills, focus on details, and curiosity which had held her in such good stead professionally as a Librarian found new opportunities as a volunteer, mostly locally, but also at the state level. Many of her efforts at various places overlapped in time during the ensuing years. Her first experience with preparing databases occurred at the UNI Museum, where she was asked to enter all hand-written collection records for the past 100 years! She gathered some database training via a reference at Iowa State University; and laboring steadily for the next 26 years, she had completed entry of over 60,000 items by the time her interests redirected her. She also became the Museum’s storyteller along the way. At Sartori Memorial Hospital, Joan began by working as a volunteer at the Gift Shop; but her talents were soon recognized, and she was asked to develop databases for fundraising endeavors and the Occupational Health division. Further, she filled eight floppy disks with word processed data associated with the hospital’s laboratory procedures. The Cedar Falls Historical Society was of keen interest to Joan and Saul. As Society Executive Director, Karen Smith says: “The greatest example of Joan’s commitment…was her willingness to take on our database project. Joan volunteered to take every hand-written document describing our artifacts and enter the information into a new catalog database. One by one, she entered each record and took meticulous care to transfer every accession number, object description, donor contact and more. She worked tirelessly on this project for years and made an immeasurable impact through her work. That cataloguing database remains our most essential tool in tracking our artifacts and managing our collections.” Joan adds that 30,000 items were eventually entered into that database. She also was a host at the Society’s museums. Joan became interested in participating at the Hearst Center for the Arts, where at the time there was no paid staff to monitor the front desk. IN addition to doing some administrative assistant work, she was asked to handle some professional correspondence for the director and prepared a database of the Center’s membership rosters. With story-telling experience, Joan was invited to participate in the Cedar Falls Community Theatre, where over time she participated in well over a dozen plays, many crews, and the Theatre’s “Mystery Theatre” activity. 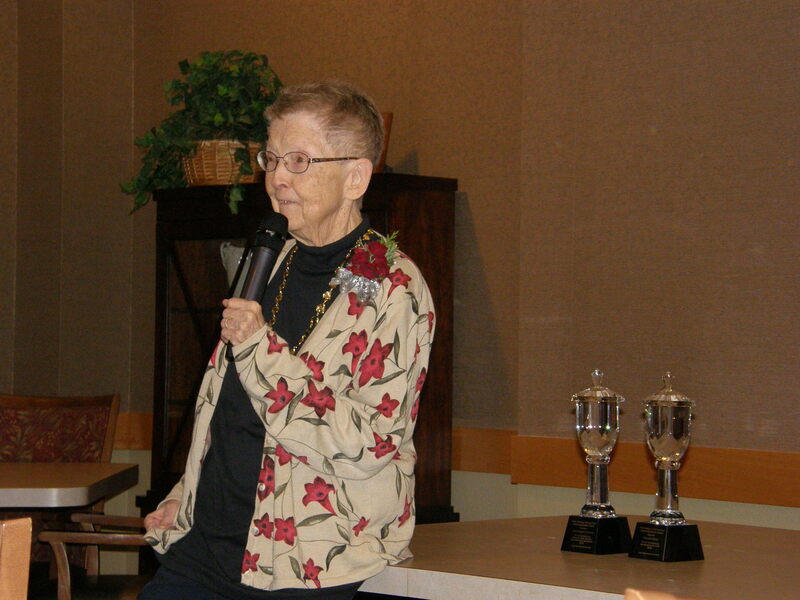 She also served on the Board of the Cedar Falls Community Theatre, as well as other volunteer activities. The Cedar Falls Tourism Center also benefited from Joan’s energy as an Envoy, volunteering her time to computer data entry projects there. For 25 years, from 1976 to 2002, Joan contributed to our state, recording audio books for the Iowa Department for the Blind. Joan has been a Friend of Community Main Street and active supporter of the Cedar Falls Chamber of Commerce. She was a Friend of the Gallagher-Bluedorn and served on the Board of the Waterloo-Cedar Falls Symphony. Joan served as Chair of the Cedar Falls Art and Culture Board and as both its Secretary and Vice President. During the past decade, Joan served on the Board of Directors of the Cedar Falls Community Foundation, where she helped identify community needs and develop planned gifts to meet those needs. Through the Foundation, Saul and Joan established the Saul and Joan Diamond Arts & History Fund. This fund offers grants for projects in the fine arts or the history of Cedar Falls that stimulate lifelong learning by providing interactive or multi-sensory experiences that go beyond merely listening or viewing. The Diamonds also made planned gifts to the Foundation through their estate in order to leave a legacy of community support well into the future. Since adopting Cedar Falls as her home over 50 years ago, Joan Englund Diamond has made a significant difference in the community through her volunteer efforts in education, tourism, arts and culture, and healthcare. Joan Diamond is a community builder and has lived the kind of dedication to community which the Peter Melendy Community Builder award celebrates.